On the way back to San Francisco from Auckland, New Zealand I did not get to fly in Polaris Business Class. 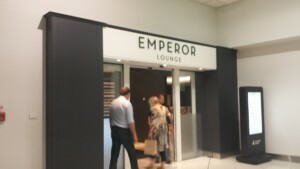 However, I did get the opportunity to check out the Emperor Lounge in the international terminal of Auckland Airport. It's to the right when you get through security, at the bottom of some escalators. Walking in I was greeted pleasantly at the front desk by the hostess. She took my Priority Pass card and pointed me around the lounge. I walked around a bit and then settled in with a sparkling water and a charging port while I waited to board my flight. There's a flight monitor screen in the room I was in, making it easy to keep an eye on when you need to head to your gate. The plugs were standard New Zealand and there were about one for every chair along the wall. I observed two open bars, with liquor and mixers available. In the fridge were Heinekens, Steinlager Pures, and a few other beers as well. 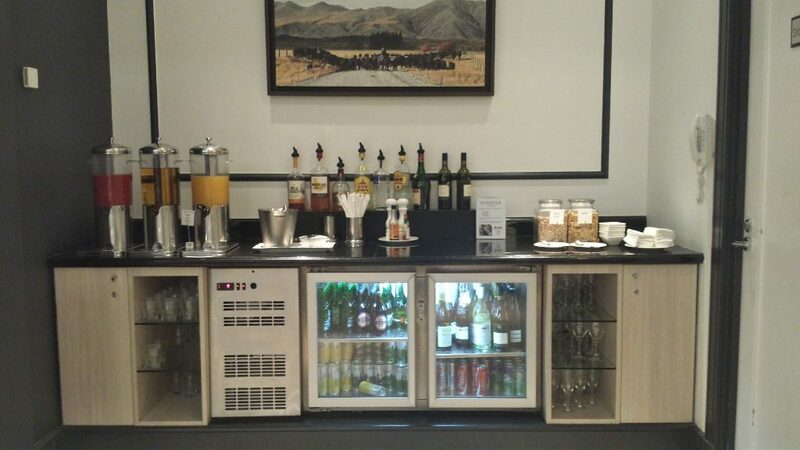 Wine, sodas, sparking water, still water, and some juices were also available, all complimentary. I arrived around lunch time. 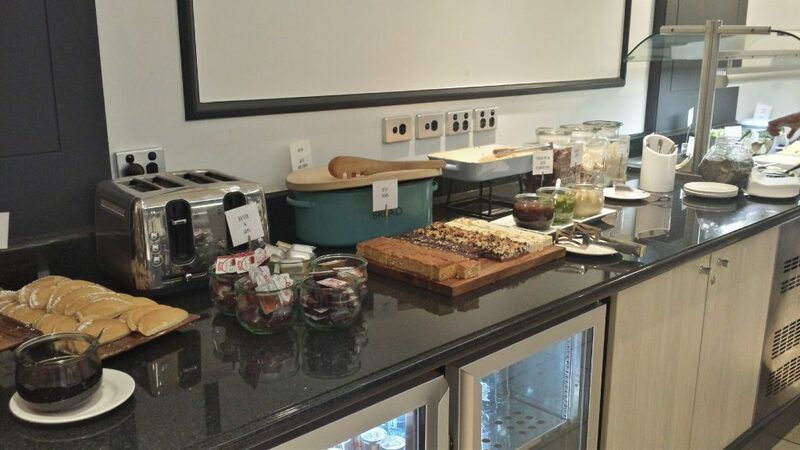 A buffet was set with a nice chicken orzo salad, rice and curry, and several other options. There was also an assorted cheese plate which was tasty. Tables and chairs were available to dine at. Couches and stuff chairs in three distinct areas provides plenty of space to relax and unwind a bit. There were about 6 large unisex bathrooms, two of which had showers and baby changing stations. 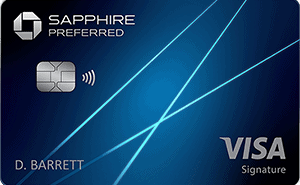 When I checked into the Emperor Lounge in Auckland Airport, I used what I thought was my Chase Sapphire Preferred Priority Pass card. The CSP comes with free lounge access. However, I accidentally used the American Express Hilton HHonors Surpass Priority Pass card, which charges $27 every time you use a Priority Pass lounge! The two Priority Pass cards look identical except for the account numbers and expiration date. Grant at the Travel With Grant blog had a similar issue. I just used the one with the later expiration date, thinking it was replacing the other card. Not true, apparently. 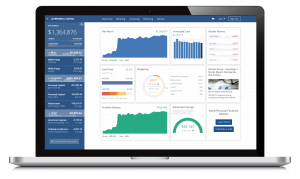 I called Priority Pass to see if they could move the charge from the AMEX to the CSP. No luck. Oh well, I will eat the $27 and learn my lesson. I chopped up and threw away the AMEX Priority Pass card and I will keep my CSP PP Card so I get free lounge access in the future. Don't make the same mistake I did if you want to save $27! All in all, it was a great lounge experience. Probably not worth $27 since I only had a water and charged my phone, but it was very nice to get away from the maddening crowds for a bit. Also, if you help yourself to the food and beverages it can be well worth the price of admission. 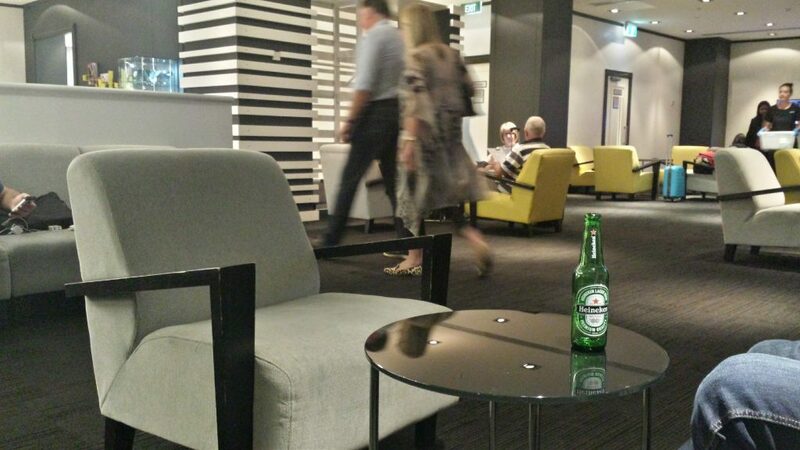 Next time I'll use my CSP Priority Pass and enjoy the Emperor Lounge Auckland Airport for free.